Have you noticed that suddenly English paper piecing has become the new hot thing in the quilting world? Suddenly hexies are all over blogland, being happily stitched during car journeys, bus rides or at home in front of the television. Everybody is at it! 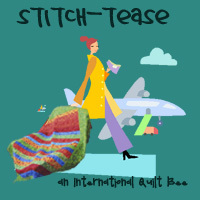 Having met Tacha Bruecher at the FQ Retreat this year and now having her in our new bee, Sew Euro-bee-an, I had to get my hands on her new book – and over the last week in breaks from everything else that’s going on, I’ve been sitting in the sunshine and perusing it. Hexa go-go fits right into what is going on in the quilting world. It’s all about hexagons, but boy does Tacha show you that there is more to hexagons than just the tried and tested Grandmother’s Flower Garden! It’s certainly a very modern take on an age-old technique and fits right in with the whole slow movement ideas that are catching on everywhere. As Tacha quite rightly says: “Hexagons are wonderfully portable – quilting’s answer to knitting”. They are also excellent for using up small scraps! The book is well written, with very clear instructions which would be perfect for beginners and the photography is great, and has a bit of a hippy, ethno-chic look to it. My favourite pieces in the book were the modern take on Grandmother’s Flower Garden, the Snowflakes patterns and the Giant Star Pillow. I really hope that we’ll see a volume two of this, branching out into other shapes, because from what I can see, there’s a big gap in the market in that area! This entry was posted on Monday, August 6th, 2012 at 10:38 am	and is filed under Books. You can follow any responses to this entry through the RSS 2.0 feed. Both comments and pings are currently closed. I loved the giant Union Jack at the Retreat and the kiddie quilt with the metallic bits on. Lovely hexies! I bought the book when it first came out and fell in love with “hexies”. I liked the the picnic quilt on page 74, but since I don’t go on picnics decided to just use one of the panels to make a runner – which I then proceeded to change to my own liking so it no longer resembles the original. Tacha’s instructions are easy to follow and I am sure that I will make other projects from the book since my scraps are starting to pile up and hexagons are so much fun!!! Oh yeah! Great book! I had the chance to see some of the quilts in real!!! They are great! I had a flick through this at FQR, but didn’t really get a chance for a good look at it. 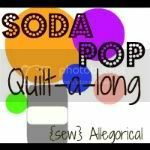 I shall add it to my quilty book wants list! It`s on my wish list! I was honored to be gifted one of these books by Tacha herself, when I met her iN berlin in June. She is lovely and the book is fantastic.